Jonathan Hickman first gained notoriety in the comic book world as the creator of the Image series The Nightly News. Marvel brought him in to collaborate with Brian Michael Bendis on the excellent Secret Warriors comic, and it didn’t take long for Hickman to take over as the sole writer. 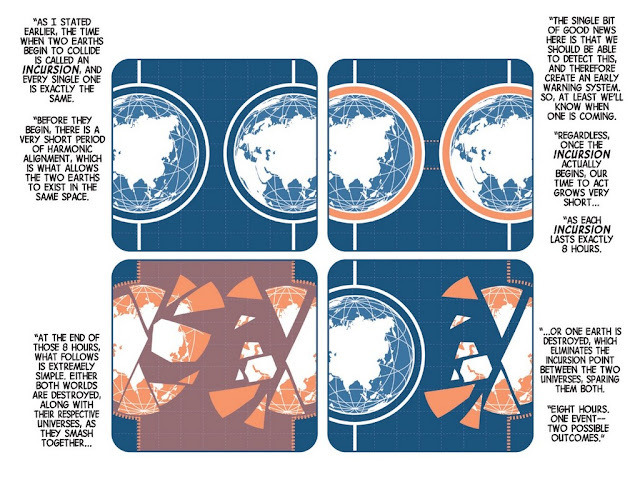 As the writer of the Fantastic Four, Hickman developed an ambitious long-form style of writing, full of complex big ideas. This style would be used to even greater effect when he was handed the Avengers franchise in late 2012. 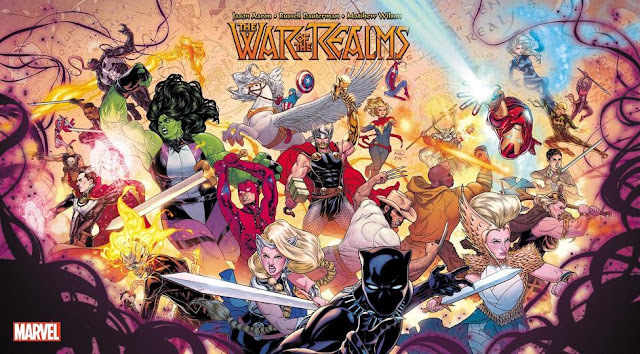 Hickman took over as the writer of the Avengers and New Avengers series, beginning an epic three-year long storyline that would eventually culminate in the massive crossover event Secret Wars. Personally, I think it’s one of the best recommendations you could give any fan of the Marvel movies that might be interested in reading some of the comics. It’s full of big threats, great moments, and fantastic characters, many of which were used in the Infinity War movie. Not to mention the beautiful artwork provided by some of Marvel’s best artists at the time, including Jerome Opena, Steve Epting, Mike Deodato, Dustin Weaver, Jimmy Cheung, and Leinil Francis Yu, among others. Let’s take a look, shall we? Hickman’s Avengers begins with Iron Man and Captain America deciding they need to expand the idea of the Avengers into a worldwide planet-saving force, an Avengers World. Good timing, because two powerful new beings have landed nearby on Mars. Ex Nihilo and Abyss arrive on Mars and terraform a portion of it to contain a breathable atmosphere and vegetation. Ex Nihilo and Abyss are Gardeners, tasked with accelerating the evolution of species by their creators, the Builders. The Builders are the universe’s oldest race, and created many races to help cultivate the universe, to include Alephs, Gardeners, Curators, Abyss, and Caretakers. They seeded worlds and directed the evolution of civilizations, or passed judgement on what they considered failed species and exterminated them. Ex Nihilo fires an Origin Bomb at the Earth in an attempt to make the planet sentient, affecting millions of lives, prompting the intervention of the Avengers. The Avengers lose the initial confrontation, prompting Captain America to expand the roster of the Avengers to win. This expanded roster includes heavy hitters like Hyperion, Smasher, and Captain Universe (along with Sunspot and Cannonball of the New Mutants). Ex Nihilo and Abyss surrender to Captain Universe because she is revered by the Builders as their creator. Captain Universe tells them to stop what they are doing, and the two agree not to leave their terraformed portion of Mars. As a result of all these events, Nightmask and Star Brand are added to the Marvel Universe (two concepts that had previously only existed in Marvel’s failed New Universe line from the ‘80s). Ex Nihilo’s failure to repair the planet attracts the attention of the Builders. Hickman’s New Avengers series begins in Wakanda with the Black Panther (in a wise bit of foresight years ahead of his blockbuster movie). 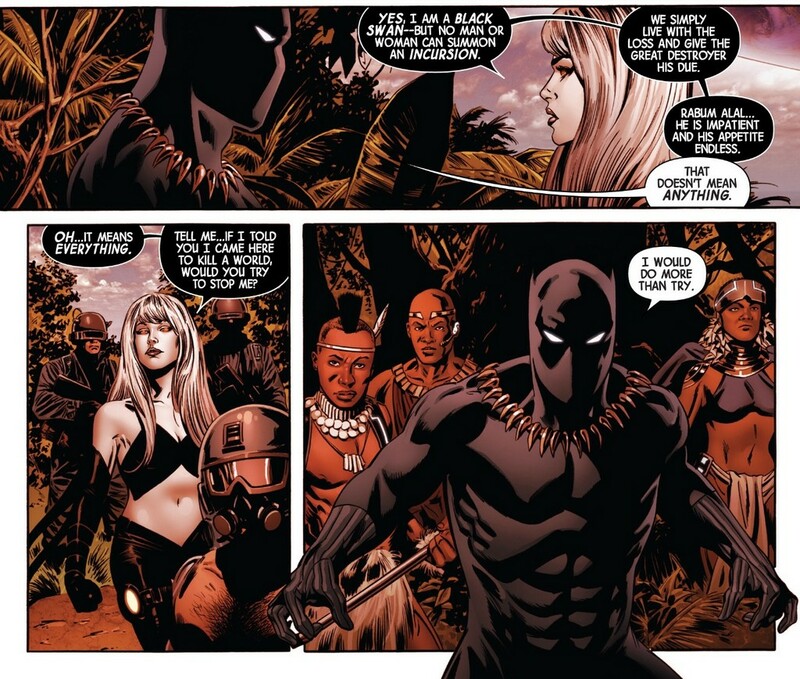 After witnessing the first incursion event (more on that in a bit) T’Challa reassembles the Illuminati, a secret cabal of Marvel’s significant heroes that have been meeting in secret for years to covertly eliminate threats or shape events in the Marvel Universe. The group consisted of Iron Man, Mr. Fantastic, Dr. Strange, Black Bolt, Namor, and Professor X. T’Challa had initially been invited but declined. At this point in time in the Marvel Universe, Professor X was deceased, so The Beast would eventually be brought in to represent the Mutant race. The Illuminati had previously been exposed, much to the disgust of the rest of the Marvel heroes, so this time Captain America was included, perhaps in an effort to appear more noble as a whole. Incursions are a result of the contraction of the multiverse causing two universes to collide, with each universe’s respective Earth as the point of impact. There is a short period of harmonic alignment where the Earths exist next to each other, before colliding and destroying both universes. The only known way, or maybe just the simplest way, to avoid the destruction of both universes is to destroy one of the Earths before impact, saving both universes, but obviously only one Earth. 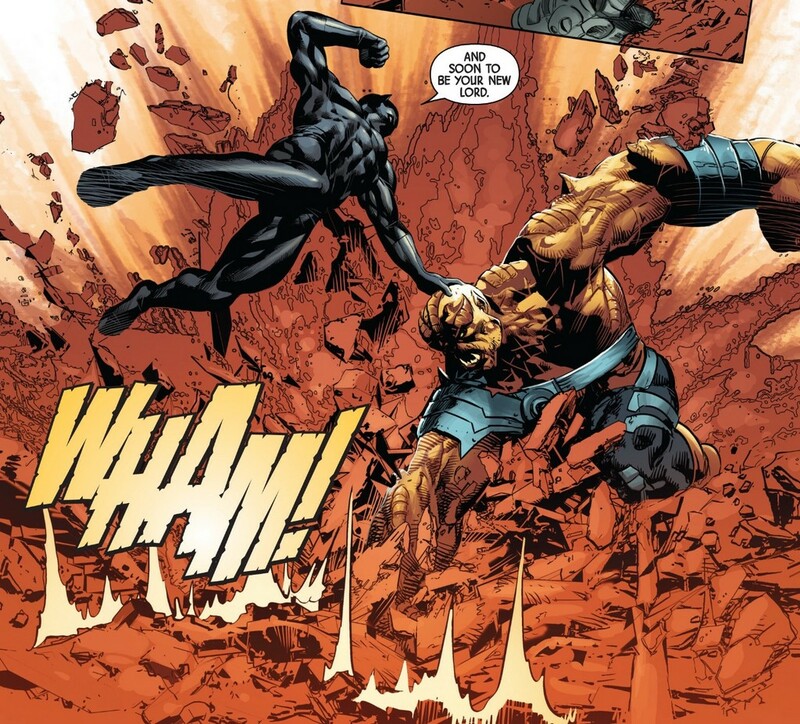 T’Challa witnesses a mysterious character named Black Swan destroy another Earth during this incursion event, saving the universe from destruction. The Illuminati capture and question Black Swan, who gives them all the above information about the incursions, and that the incursions began after the death of an unknown universe 25 years prior. Also, she is a servant of Rabum Alal, the Great Destroyer, which will be important later. The Illuminati do their best to come up with any solution that doesn’t involve destroying an entire planet. Having previously assigned themselves the task of safeguarding the Infinity Stones, they decide to reassemble the Gauntlet and use that power to keep the planets from colliding during the next incursion event. They nominate Captain America to wield the awesome power and responsibility of that task. 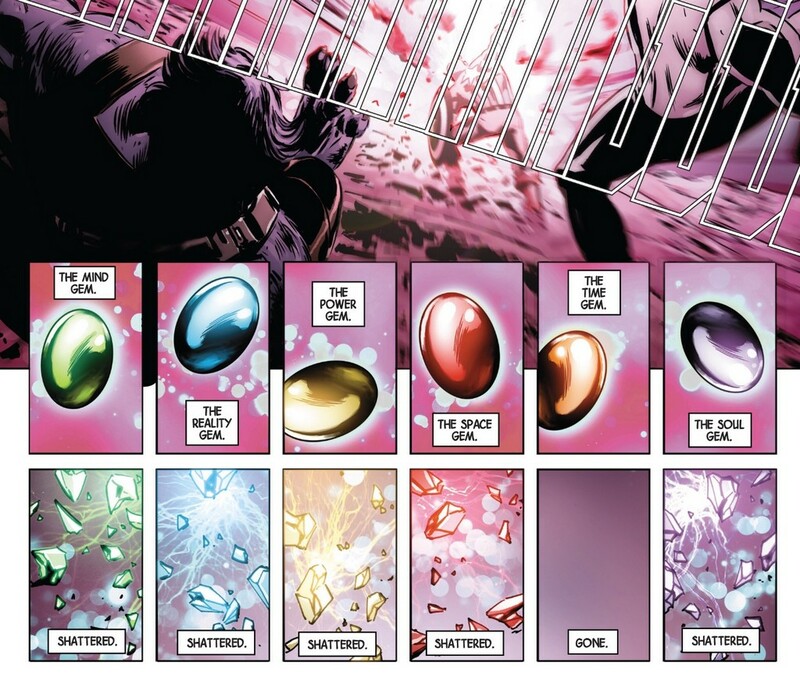 He succeeds in pushing the invading Earth back, but is unable to control the power in his grasp, resulting in the destruction of all but the time stone, which disappears. Even with no other ideas to prevent the next incursion, Captain America still refuses to accept destroying an entire planet as an acceptable solution, and subsequently has his mind wiped of the entire matter and is removed from the Illuminati. This will have negative consequences for them in the future. The Illuminati have no choice but to create a weapon capable of destroying an entire planet, to save their own. Elsewhere, the incursions have attracted the attention of the Builders, who have decided that to save the multiverse, every Earth must be destroyed. As part of the fantastic Avengers event Infinity, the Builders cut a path of destruction through the universe, annihilating entire worlds in their path towards the Earth. The Avengers led by Captain America leave for space, recruiting Ex Nihilo and Abyss to come with. They join a council of worlds including the Kree, Shi’ar, Brood, Skrull, and Spartax Empires. The Illuminati stay behind on Earth, as the secret threat of the incursions still remains. 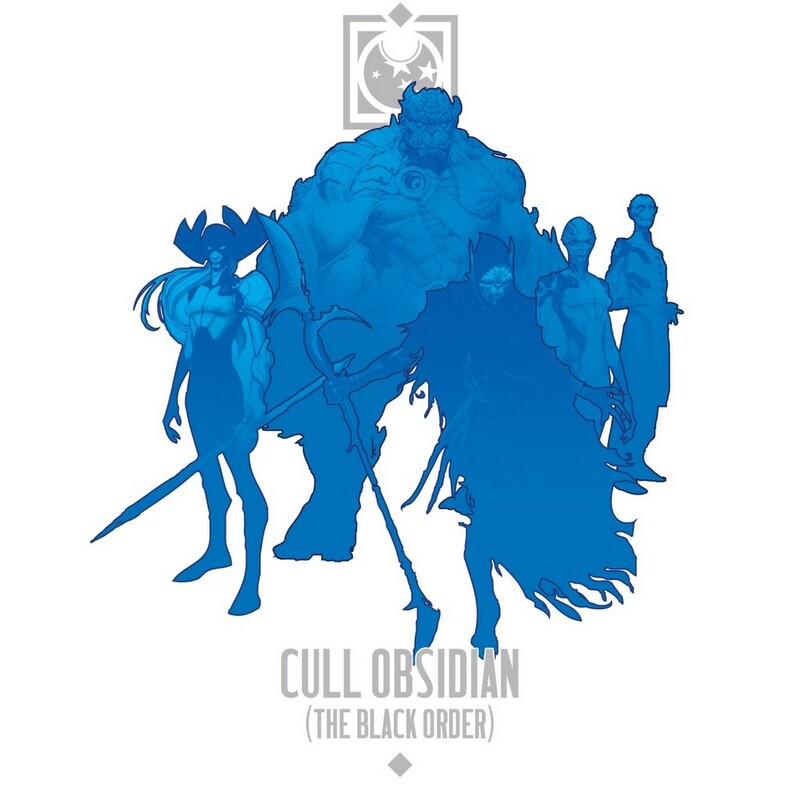 Meanwhile, Thanos decides to invade a much less protected Earth, accompanied by his ruthless Cull Obsidian, aka the Black Order. The Black Order consists of Corvus Glaive, Ebony Maw, Proxima Midnight, Supergiant, and Black Dwarf. They did not, and could not, get their just due in the Infinity War movie (except for Ebony Maw, who was spot-on) due to time constraints, but they are much more entertaining in the comics. 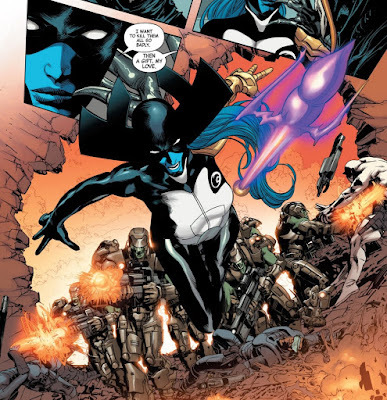 Proxima Midnight in particular is wonderful. In space, Spartax flees in an attempt to save themselves, and the Kree surrender to the Builders, in hopes of being spared. After a few small victories, Captain America appears to request a parlay so that he can surrender to the Builder left in command of the Kree on their home planet of Hala. Thor is sent as the representative of the coalition. 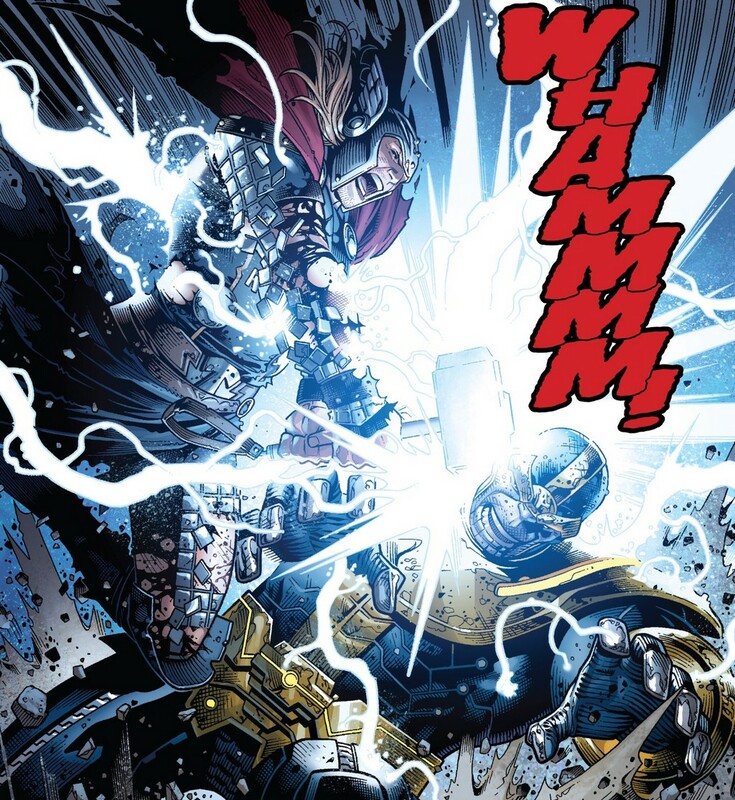 The Builder broadcasts what he assumes will be the surrender of the resistance to most of the universe, but instead is killed by Thor’s hammer after he hurls it around the Kree sun, sending it hurtling at incredible speeds back to his hand through the torso of the Builder. This is one of the best moments of recent Marvel comic history, I can picture this in my mind happening to the raucous cheers of an adoring movie audience. So of course some fans on the internet complained that Captain America and Thor murdered an opponent after essentially waving a white flag, making them dishonorable. These fans don’t know how to enjoy things. This victory emboldens the united Empires, proving definitively that the Builders can be beaten. Ronan kills the Kree Supreme Intelligence, and leads the Kree back into the fight. Strengthened by a recently revived Captain Universe, and an unleashed Star Brand, the Avengers and their allies successfully defeat the Builders. The surviving Builders retreat to the Superflow, a waystation between universes. The Avengers do not have much time to celebrate, however, as they almost immediately learn that Thanos is on Earth once communications are restored. The Avengers and their allies return to Earth, defeat the armada Thanos has fortified in orbit around Earth, and a glorious battle is had with Thanos on the planet below. In the epic battle, Corvus Glaive is killed by Hyperion. There is an especially thrilling moment when Thanos and Thor battle head-to-head, a moment that would be adapted for the climax of Infinity War, seen at the top of this column. 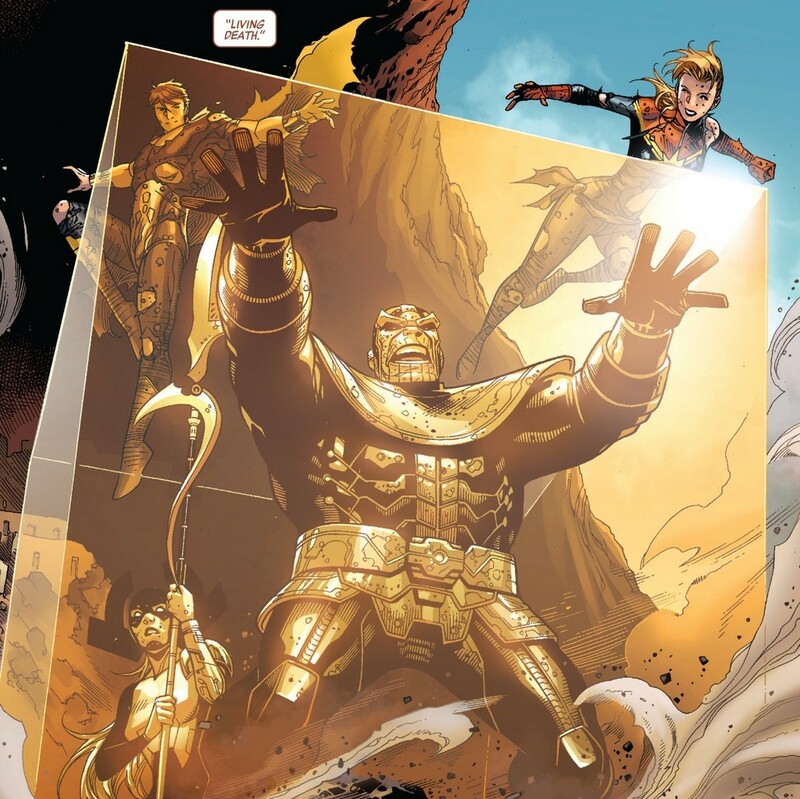 Despite all their efforts, Thanos and Proxima Midnight push the Avengers to the brink of defeat. 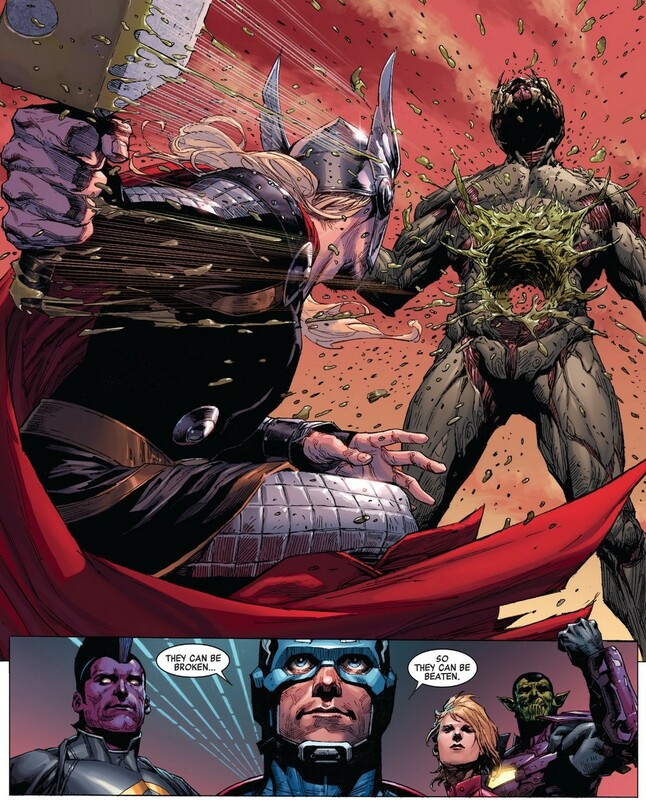 However, Ebony Maw turns on his master and manipulates Thane into using his new Inhuman powers to freeze Thanos and Proxima Midnight in amber. That’s where we will end this week. If universes smashing into each other and exploding doesn’t intrigue you, then comics just aren’t for you. If Thor throwing his hammer into space so that it hurtles back to him through the torso of a sadistic alien being doesn’t excite you, comics are not for you. It’s okay if they don’t, there are plenty of other things to do. But if these things do excite and intrigue you, then you definitely want to give these comics a try.